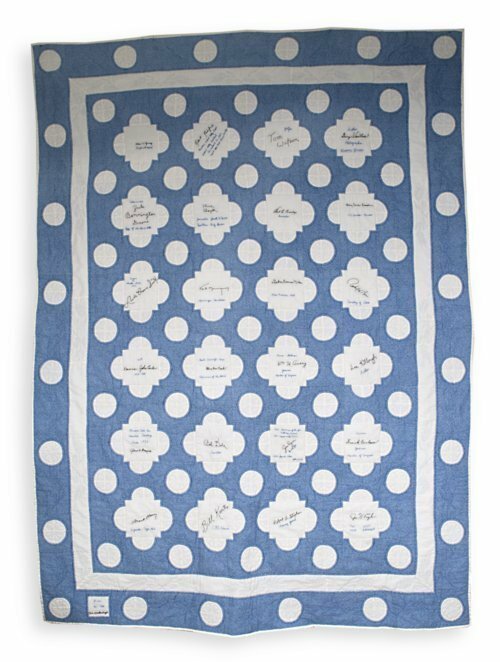 Blue and white quilt featuring the embroidered signatures of 24 prominent Kansans. Made by Marie Marcellus Burgett of Junction City to celebrate Kansas' 125th anniversary of statehood, 1986. Burgett obtained the signatures of 24 living Kansans on white fabric squares, and embroidered the signatures along with a summary of each individual's achievements. The quilt won a grand prize at the Riley County Fair, and reserve champion prize at the Geary County Fair, and was exhibited in the Kansas Capitol. According to Burgett, the blue fabric represents the Kansas skies. Made of cotton/synthetic blend fabrics. White binding and navy blue backing. Machine-pieced. Hand-quilted with outline stitching around signatures, and also sunflower and wheat designs.